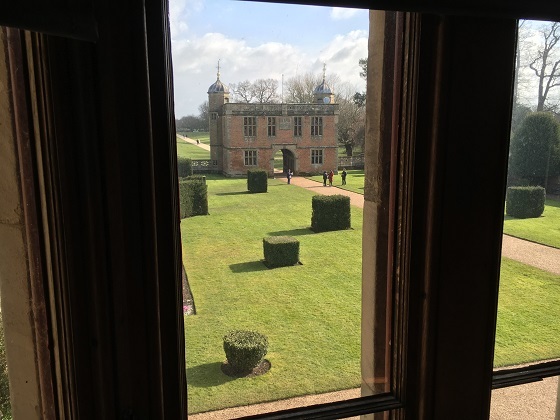 We took a trip to Warwickshire to catch up with family and managed to squeeze in a visit to lovely Charlecote Park. This National Trust property is just a few miles from Warwick and Stratford Upon Avon, slap bang in the middle of beautiful countryside. A packed car park on arrival made my heart sink a teeny bit, but once through the National Trust ticket office and into the grounds of the estate there was more than enough space for everyone. It didn’t feel one bit crowded. The walk to the house is magnificent. A long, straight path leads under a gorgeous brick gatehouse, apparently built to honour the visit of Queen Elizabeth I. We spied a sign at the gatehouse for guided tours on the half hour. We’d arrived just in time, saw a few people waiting so joined them. Unfortunately no-one turned up, after about twenty minutes and almost frozen solid we decided to give up and explore by ourselves. 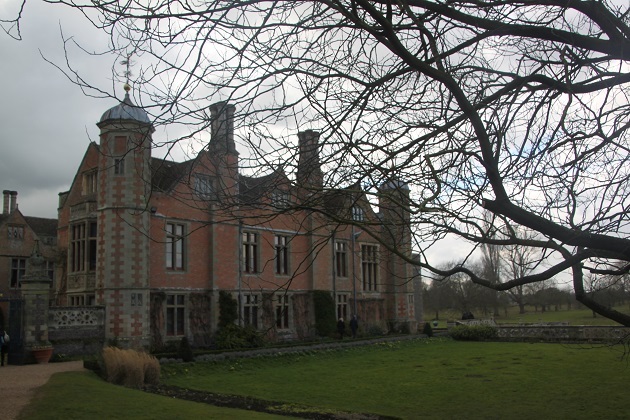 The house is beautiful, the home of the Lucy family who have lived here for 900 years. They passed the property over to the National Trust in the 1940’s on condition they could live in a wing of the property. They still do and it is very much a family home. 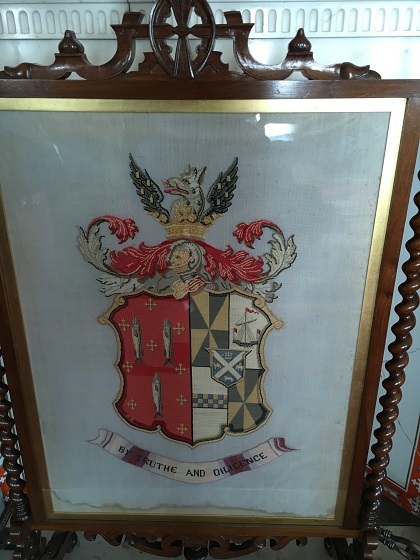 There was a trail around the house about Mary Elizabeth Lucy, one time mistress of this place with information on her life and times and how she and her husband extended and furnished this place with objects from all over the world. I found it fascinating, so much so that I bought a book about Mary Elizabeth in the bookshop – it proved to be a wonderful read. 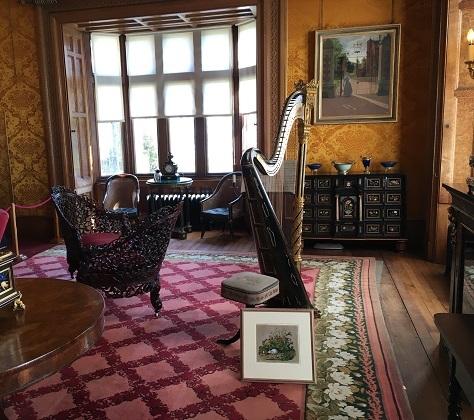 The entrance hall is stunning, the billiards room is really impressive and the library (always a favourite of ours in these houses) had the most incredible view out into the garden and down to the river. A real highlight for us was the outbuildings. 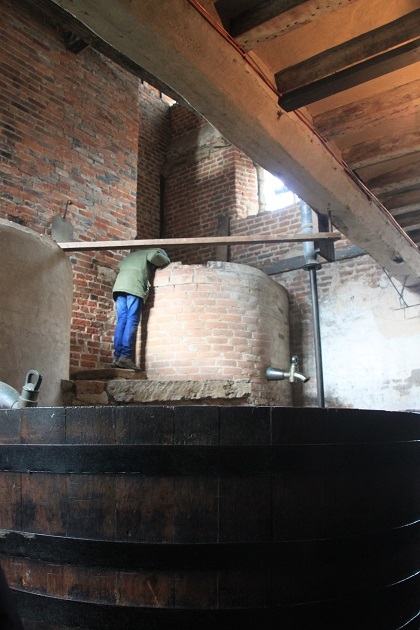 We saw the laundry, old brewery building and stables where I read a moving tale of how Mary Elizabeth Lucy and her husband set off on a European trip in one carriage with six children, including a young baby. The baby died as they were crossing the Alps but before they returned another baby had been born in that very same carriage. Son had a whale of a time in the kitchens. There was a big fire in the hearth – very welcome on a freezing day – and lots of activities for children going on. 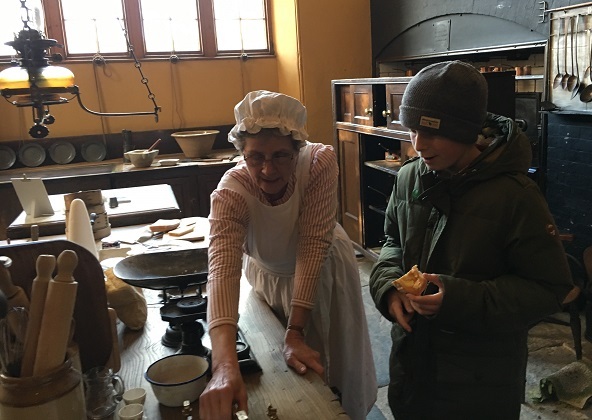 He made his own toast on the fire and chatted to the “kitchen maid” about the weights and measures they used. Time for lunch and we headed to the cafe but found it impossibly busy with a large queue of people ready to pounce on tables as they became available. Unable to handle the stress, we walked back down the drive to the Pheasant Hotel and pub just across the road. It was virtually empty, we had delicious soup and sandwiches and thawed out for a little while. 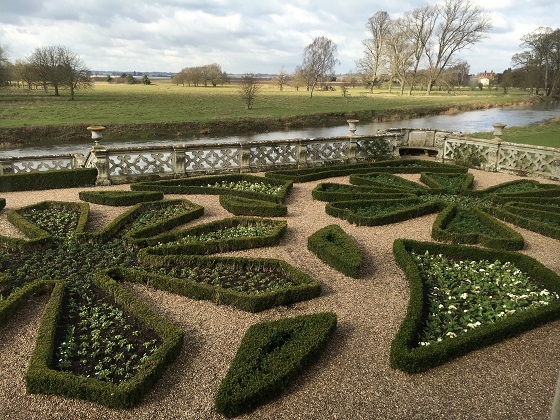 We returned to explore the lovely grounds – the garden behind the house is beautiful with great views of the river. 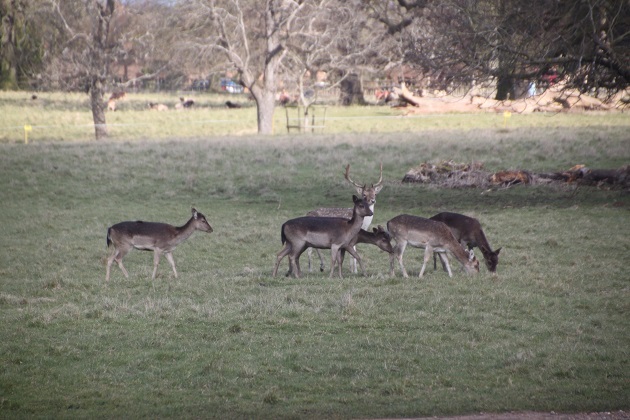 Further along is a deer park designed by Capability Brown with a herd of deer still roaming freely. Tradition says William Shakespeare was once caught poaching deer here when he was a boy. It might be true, the estate lies not far from where he grew up in Stratford. Apparently he was forced to flee the area to avoid prosecution by Sir Thomas Lucy. He escaped to London and the rest is history. 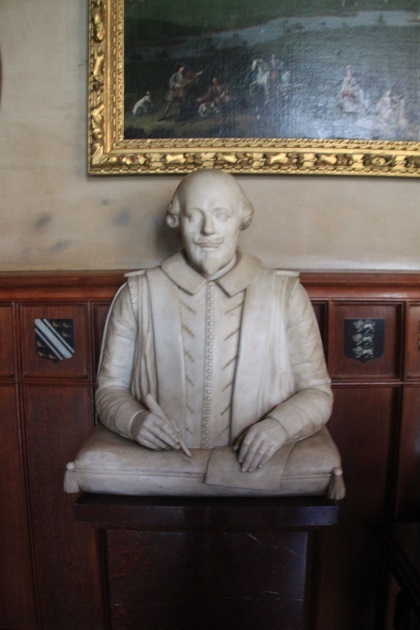 They say Shakespeare got his own back by casting Sir Thomas as Justice Shallow in the Merry Wives of Windsor. 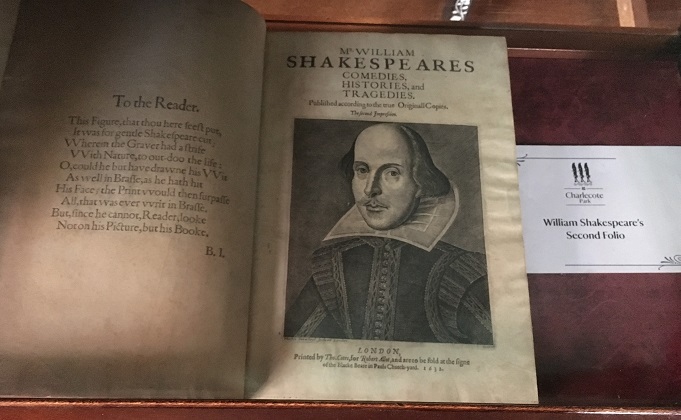 There is a bust of Shakespeare in the house and we saw his Second Folio on display – they are proud of the connection nowadays. We left the grounds just before closing time. 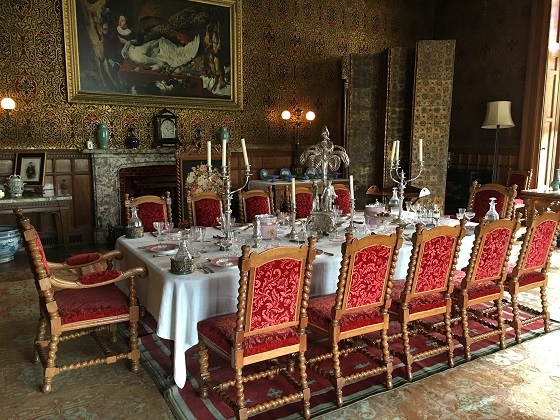 The house is a delight to visit, the location is stunning and we had the most wonderful afternoon. One to add to the “to visit” list! It’s a gorgeous spot, even on a freezing wintery day. I once lived in Stratford and this was always one of my favourite places. Thanks for the memory nudge! 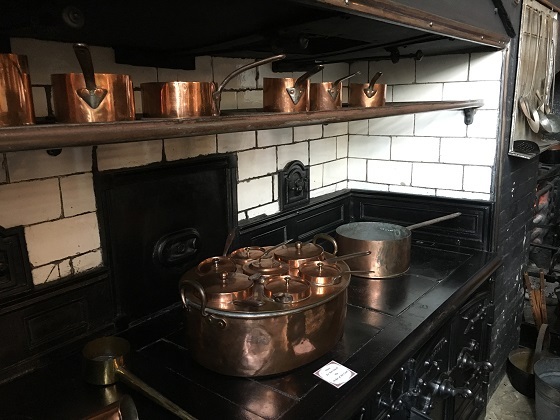 It’s a great place to visit, I loved the history and the family story. We’d definitely go back and explore the countryside a bit more – when it’s warmer! Beautiful! Absolutely beautiful! I need to decorate my house like this. Inspiration, yes! It’s gorgeous isn’t it!! They knew how to decorate in those days. What a lovely property and estate. Thank you for the guided tour! 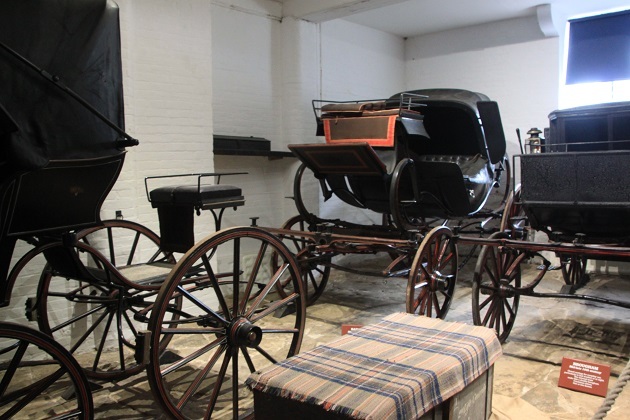 It was so interesting to read that the family enjoyed travelling so much to take their carriage through Europe – intrepid travellers in those days! I’ve visited Stratford, Warwick and Leamington Spa a couple of times but not for ages so it would be nice to return. 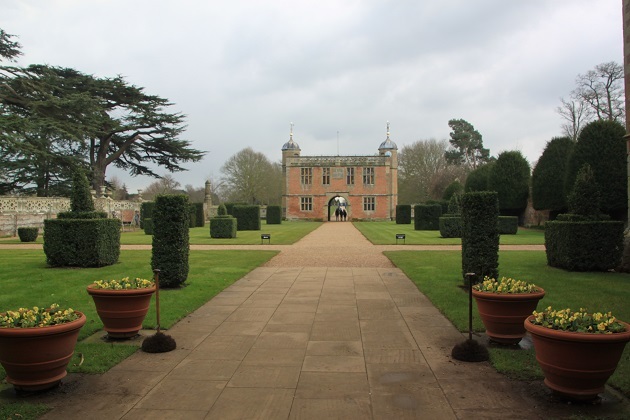 Warwickshire seems to be one of those counties we whizz past on the M40 but we need to revisit and take a look. Hope you have a nice weekend. Cold and damp here – let’s hope it improves! A trip down Memory Lane for me! I lived not too far away and so visited this park a few times. However, as is often the case, the nearer you live to a place, the less you know about it. I never remember actually going inside; we just wandered through the park! So true Denzil, places close by tend to be the ones most overlooked, we are definitely guilty of that!! The house is fascinating, definitely recommend if you ever make it back that way. 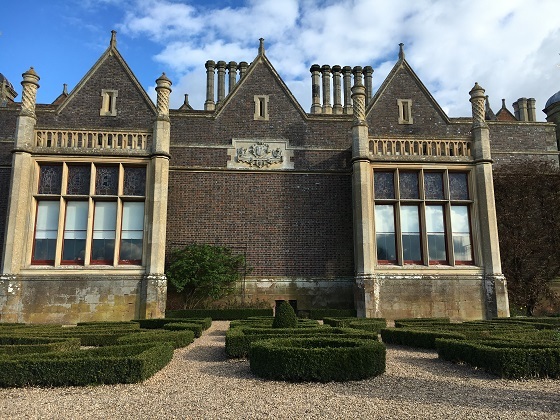 I’m not familiar with this area of the UK – it looks like an impressive stately home, and I love the landscaping in the grounds! The deer park reminds me of Knole, a deer park in Kent (also owned by the National Trust) which I used to visit a lot when down at my grandma’s over the summer holidays. We don’t know this area at all well either and stumbled upon this place just looking for somewhere convenient to meet up. What a lucky find though – it was so interesting and a beautiful setting too. 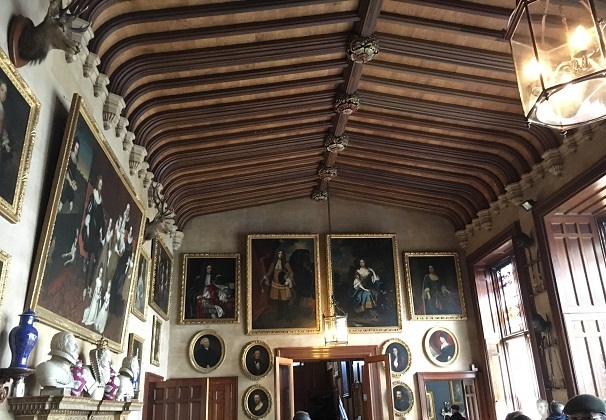 Just had a look at Knole – looks gorgeous too… good to know about in case we make it to Kent sometime!! 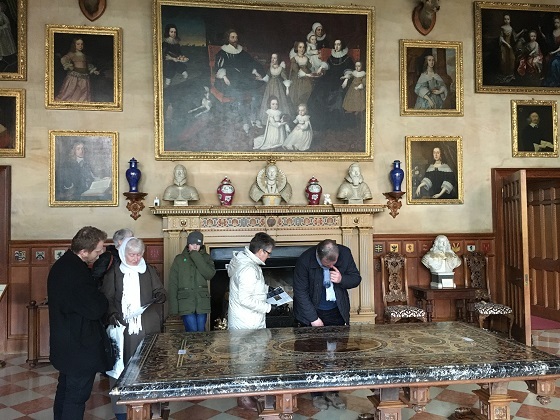 The interiors are magnificent, so grand and opulent and a great place to explore. 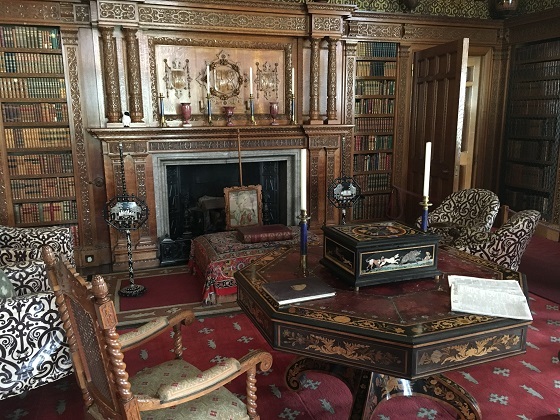 Joy, what a beautiful estate…the library was just stunning! Seeing the harp was a pleasure, I don’t play harp, but I have always wanted to. The grounds are lovely. Thanks for taking me there! 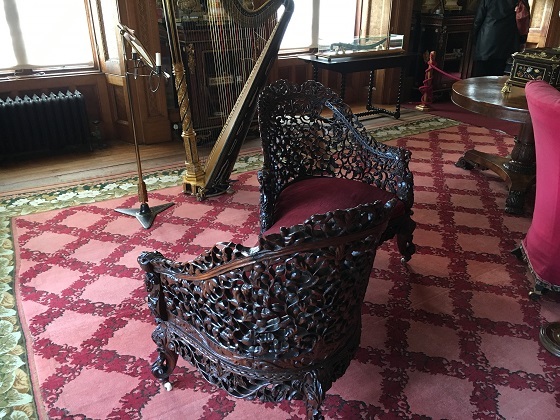 I loved that harp Pam – so intricate and beautiful even to look at! 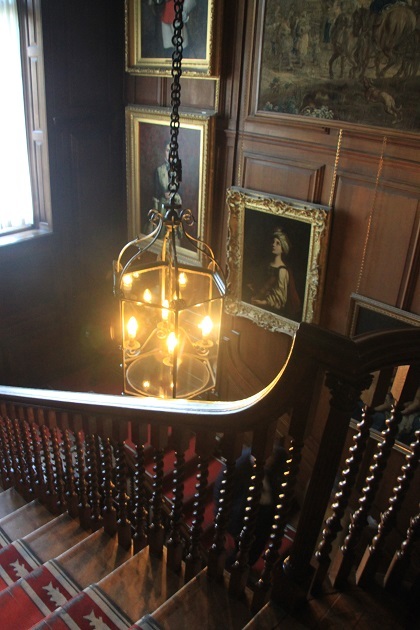 The house and grounds were just wonderful to explore – thanks for coming along and have a great weekend! The backs of the wooden chairs are works of art. So intricate. Reminds me of chocolate too but that says more about me than the craftsmanship! It does look like chocolate – now that you say it!! I took so many pictures of those chairs – loved them. What a magnificent property thanks for the tour. Imagine having a house so large that you could never fill it with furniture. It was a magnificent house and every room was just gorgeous and very ornate. These huge mansions always blow my mind and are so lovely. What a lovely historic property. 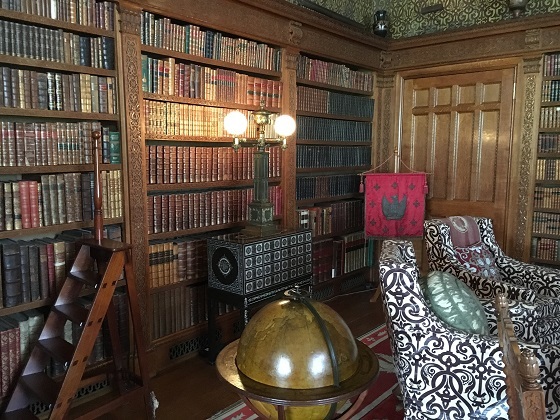 Can you imagine having a personal library that looked like that? It is a book lover’s dream. I always love the libraries in these old places but this one was especially lovely – something about beautiful old books that just does it for me! Sounds like a delightful time you had. 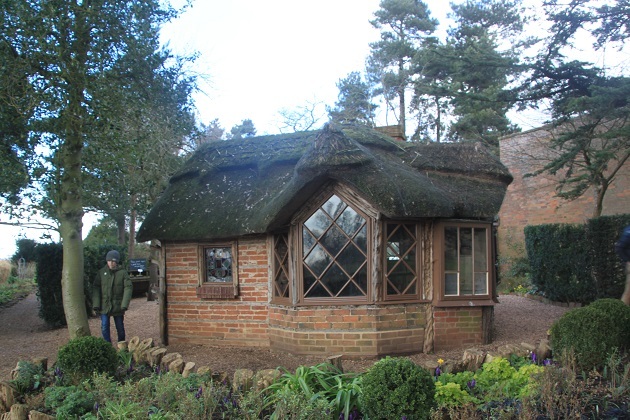 It really was Terry – despite the freezing cold we had a great time exploring inside and out. I thought the same about Mary Elizabeth – hard enough setting out on a car journey with just one child sometimes!! It is a gorgeous place Rosemary and I was very glad we stumbled upon it when looking for somewhere to meet up. All that plus I got that great book about the family in the bookshop! We have a bit of sunshine today, not sure how long it will last but at least it’s here!! Hope your weekend is going well too. I love books like that Joy – I find people’s histories so interesting! I guess they didn’t have child restraints in those carriages either plus how on earth would you cope with a crying child? The mind boggles!! Hope the sunshine lasts! We’re coming over at the end of next month again – that will come round quickly! Oh you’ve definitely added one to the list for me! I’m not sure if a trip to Stratford upon Avon is on the cards for me this year, but it’s certainly one to add to the ever growing list! You could easily combine this place with a trip to Stratford, it’s beautiful and really interesting, I definitely recommend. Hope you get to visit sometime soon! Wow! No one does over-the-top homes like the British! This one is pretty special and very splendid I think!! Not your average home for sure. What a shame, it’s a great day out! Still, an excuse to come back again! As always, I thoroughly enjoyed your blog. I’m sending a link to my daughter who is a Shakespeare scholar. I’m sure she will enjoy it too. Thank you!! The Shakespeare connection really interested me, apparently the locals have been telling this story for a very long time. Some say it isn’t true but who knows… I just like the idea! I always love reading about all the National Trusts you all have..so many fascinating ones including this. Beautiful! We get such great value from our National Trust membership and love these days out. The family stories behind the different houses always intrigue me and the settings are always gorgeous. What an amazing visit 💕 I can see myself strolling in the gardens. What a story about the babies and the carriage, life hey! I know – that trip with all those children and then an extra baby in the end. What a tale that carriage could tell!